So you've got your sampled acoustic drum kit track sounding realistic in terms of performance and source sounds, but there's still one more job that needs doing before you can consider it finished. 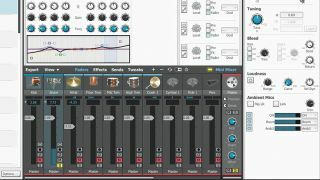 Yes, we're at the mixing stage - here are seven indispensible info-nuggets to help you cross the percussive finish line. A high-quality drum kit ROMpler will use numerous spot mic channels, so it's easy to view them as a collection of unrelated individual sounds, a bit like a drum machine. However, kit drums are played as one instrument, and when mixing them it's best to think of them as such. So, rather than focusing on the close mics when building your kit balance, start with the overheads or nearer room mics as your basic stereo canvas, then enhance them with the spot mics as necessary. One of the most powerful aspects of the better ROMplers, like BFD 3 and Superior Drummer 2, is the inclusion of mic bleed and cross-resonance between drums, including sympathetic snare buzz. Being able to control the amount of this is a truly amazing thing, and far easier than dealing with a real kit. Rather than waste time trying to tidy up these sounds using traditional techniques, head straight to the settings of your ROMpler and control them accurately at the source. Don't be shy about EQing the close mic channels aggressively to get the punch that you want. For snare body, look between 200 and 400Hz, and for kick thump get busy between 80 and 120Hz. Scooping out the low mids on the kick works well, too. For toms, try boosting and sweeping with a sharp peak EQ to track down the key frequencies. Finally, use a high-pass filter to remove any rumble and clear out unnecessary low frequencies on all channels. Overhead and room mics can be notoriously phasey, particularly with spaced mics, potentially causing elements that you want roughly in the middle (kicks and snares) to drift off centre. Address this by adjusting the L/R balance of your overheads and room mics to get the correct balance, then bolstering them with the close mics, keeping the snare and kick roughly central. Phase-invert the kick and snare close mic channels to find the punchiest result, and always check the overall balance in mono. Often you'll find that room mics sound great but a little too 'distant', and any form of processing applied to the recording, such as compression or EQ, only goes to make the problem more obvious. One useful mixing trick is to shift the timing of the room mic channels, nudging them earlier. Doing this on a ROMpler may require you to bounce the room mic channels as an audio track, then reimport it and shift it manually. How much to do this by depends on the room in question, but once shifted, remember to re check the phase coherence of the kick and snare, as described in tip 4. The smoothest-sounding kit balance will usually come from the room mics, with the harshness of the cymbals and hats reduced and diffused by the room reflections. This makes the room mics ideal for some aggressive compression. For the classic compressed room sound, reach for a fast FET compressor. With a medium attack, fast release and 10dB or more of gain reduction you can bring up the ambience, creating an energetic sound that, even in small quantities, will add drive to the overall kit. While any drum kit ROMpler worth its salt will feature room mic channels, snare drums in particular can benefit from their own dedicated reverb - or even two reverbs. For maximum flexibility, set up one small and one medium-to-large reverb as auxiliary effects, and add small quantities of each to obtain a suitably smeared effect. If you find that you're getting too much build-up in the low and low-mid frequencies, EQ the lows from the return.